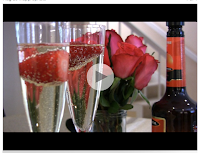 Amanda Salem from Patch helped me to make a few drinks to get your romantic Valentine's evening off to the perfect start. The first cocktail is a peach liqueur-soaked Bellini and the second is a fresh Raspberry Crush Martini. Let us know which one you chose to make and how your drink complimented your special night!